I felt unhinged by Saving Mr. Banks. First of all, it is always amazing to see respect lauded on a writer. Respect is not why I write. But I have to admit that reverence for a writer – in this case, P.L Travers, the author of Mary Poppins, a children’s book, is a rare and beautiful thing. From a feminist perspective, I loved that the men, even the studio head, the great Walt Disney himself, deferred to Travers. Of course we all know men who defer to their female bosses or wives or business partners. It should not be an oddity. But somehow, the world has turned and I rarely see men respecting women in mainstream movies. Maybe because I have teenagers I am overexposed to hyper-sexualized women in the media on awards shows – too many women rock stars wearing lingerie while the men wear black tee shirts and jeans. But seeing Travers run the show? Well, that was just amazing. She is occasionally arbitrary – but what genius is not? Emma Thompson is brilliant at creating this very real, flawed, lovable, cold writer. 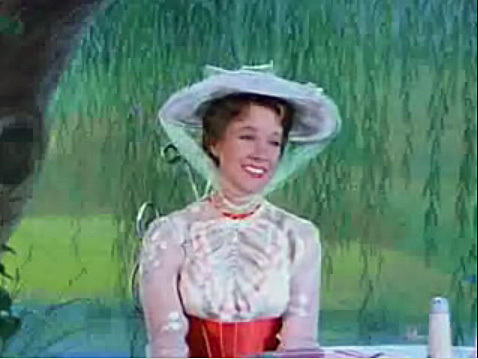 I loved, too, that Saving Mr. Banks explained why Mary Poppins does not change as a character. Like everyone, I love the Julie Andrews movie. But it’s always bothered me that Mary Poppins does not change – she does not become more loving or more interesting as the film progresses. Her character does not go through the fires of some great conflict and come out the better for it. This movie explains why. She is the agent for other’s transformation, not her own. Change is reserved for Mr. Banks, the father, an idealized version of Travers’ father. Our Travers gently returns to being an imaginative and playful person. This transformation into a loving human being happens in small ways. Our hero here does not suddenly turn around and become a fabulous new person. This is a subgenre of movie I happen to love — watching characters return to love — like the movie based on C.S. Lewis’ Shadowlands. Now, you know, I have to find something not to love. I did not love that Travers seemed to be seeking to come to terms with only her father. What about her mother? She certainly was equally complex. Is the mother not as curious and exciting and crazy a character to explore? Or are men more enigmatic? Why must it be the father we need to heal? I, like Travers, have a treasure trove in my past – a childhood of great love, adventure, and benign neglect. But it is in from this personal history that so much creativity can spring from. This book reminded me of Alice Miller’s Drama of the Gifted Child, a psychological text that explains why overly sensitive children do not have a full childhood as they are always in tune to their parents’ struggles. Then, as adults, they are adrift. They are less inclined or able to explore their own lives. I think about this from my own story and from my children’s reality. There are times that I, perhaps due to Chris’s Parkinson’s, as a parent, turn to the children for more support than maybe they need or want to give. And then there are times, too, I just let them off the hook — but that’s another story. Or maybe it’s the same story. It’s the story of excessive attachment and then, benign neglect. I console myself with the certainty that great creativity can come from a troubled childhood. You should see — or read — this story. Think about it, talk about it — about respect for writers, women as creative leaders, the importance of childhood, and what makes for creative genius. Apparently the last 24 hours are made for the internet to encourage me to think about myself, my past, and how I frame it. This is no exception. Hard work. Thanks for writing. Yes, you are the creator of your story. Get real. Get creative. Just make it your own. No one else can!